Consisting of a two blocks of wood clamped together with a pulley in the center. The pulley is fitted to shaft moving on the ball bearings. A lever bar is attached to one of the blocks carrying a weight hanger at the outer end. Aspiring balance is also fitted to measure the load factor developed with the tightening of the block with wing nuts and spring. 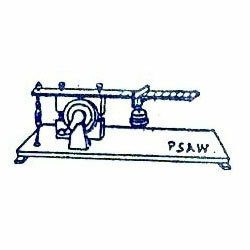 Rope break/electrical break/mechanical break dynamometer are made with mechanical or digital parameters. Dynamometers are driven through 1HP 3 phase and single phase motors. - The Help Of Spring Balance & We Can Measure Load Applied. - The System Can Be Manually Operated Without Motor. The help of spring balance & we can measure load applied. The system can be manually operated without Motor. Keeping our synchronization with the development taking place in this industry, we are engrossed in delivering a broad range of Rope Brake Dynamometer Test Rig. As per the IS 13453 : 1994 the purpose of the Brake Inertia Dynamometer is to conduct various tests for performance and durability for the Two Wheeler Disc Brake System like. The new Black Widow from Super Flow is a break through in versatility and performance among water brake dynamometers. 11, 000 RPM, 3, 000 HP and 2, 500 lb-ft capacity. The Froude Hofmann Brake Inertia Dynamometer is arranged ‘in-line', with the main elements being flywheel assemblies, brake test area, DC or AC machine, and a disc brake. Consists of a cast iron truly machined wheel of 45 cm. dia with a groove. The steel axle is mounted on call bearing to minimize friction and assembled on a sturdy wooden frame. Provided with an extension balance, rope and set of slotted weights and hanger. Consists of a cast iron truly machined wheel of 45 cm. Din with a groove. The steel axle is mounted on ball bearings to minimise friction and assembled on a sturdy wooden frame. Provided with an extension balance, rope and a set of slotted weights and hunger.